Do all the products come with a guarantee? Are the client reviews real? Is it possible to try products before buying them? Can I request a product without a reference number? Is it really secure to pay by credit card? When is the card payment charged? Do you make deliveries throughout Europe? What checks should I make during the delivery? “Satisfaction or your money back” - but how do I return a product? What covers the "Total Protection Warranty"? How can I get help setting up my new equipment? How can I reprint an invoice? How can I stop receiving newsletters? How can I contact Onedirect? Onedirect has over 2,000 products in our catalogue, 98% of which are always in stock. Available stock is shown on every product page and is updated daily. If you can't see whether a product you are interested in stock, please call our sales team on 0333 123 3050 or contact us to find out if it's available. Onedirect displays the manufacturers' recommended retail price. For some products, we offer special deals on promotional packs or discounts for bulk purchases, so you can get the best price. Of course! All the products we sell come with a manufacturer's guarantee for at least 1 year, and most are guaranteed for 2 years. If a product you have purchased develops a fault while under guarantee, we will organise for it to be repaired as soon as possible. If it stops working outside the guarantee period, we can provide you with a quote to repair it at the best price. 100% of the comments about our products have been written by customers, who have bought and used the goods. Within a few days of ordering from Onedirect, you will receive an email inviting you to write your opinion about the product(s) that you have purchased. 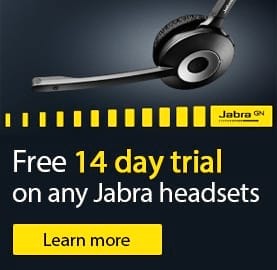 Onedirect offers a free 14-day trial on all our headsets for customers who hold an account with us. At the end of the trial period, if you do not wish to keep the product you have ordered, we will refund you in full. Find out more about the free 14-day trial. There are some products that don't appear on our website yet, although we have them in stock. If you can't find the product that you are looking for, please don't hesitate to contact our sales team on 0333 123 3050. Do you have a specific request? Are you looking for any product in particular? Contact our sales team by telephone on 0333 123 3050 (local call rates apply) or complete the Request a quote form specifying the product you are loooking for. One of the Onedirect sales team will contact you during the day with details. 1. Sign in or create an account! Is it your first purchase? Please create your account. To do this, all you need to do is introduce an email address, create your own password and complete the contact form. Remember the email and password that identifies you, as you will be asked for this information every time you enter your personal account page. Already a Onedirect customer? Sign in with the same email and password you used for your first order. Forgotten your password? Just click on 'Forgetten your password?'. Enter your email address and your password will be sent to your email address. After choosing your form of payment, we just need to confirm your order. You can print a summary of your order and you will receive an email confirming your order with all of the reference numbers you need. NOTE: This form of payment is exclusively for businesses with a VAT number, following checks by our Credit Department. All credit or debit card transactions are handled by WorldPay's secure online payment system.No card numbers are registered on our servers, which means that you will have to introduce the card number every time you make an order. Find out more about payment methods. Card payments are taken the moment the order is confirmed. Onedirect will then deliver your order within 5 days*. Find out more about delivery times. *In cases of incidents/unforeseen circumstances, deliveries may take a little longer. You can cancel your order at any moment by contacting our sales team on 0333 123 3050. The amount paid on your card will be refunded to you in the shortest time possible. NOTE: If you cancel an order after it has been dispatched from our warehouse, we will make the refund when we receive the returned package. Onedirect delivers to all European countries. A supplementary charge for this service will be added to the delivery fees. For more information contact our sales team on 0333 123 3050. At Onedirect 96% of orders are dispatched the same day! If you opt for our standard delivery service, you will receive your order within 5 working days and if you choose our express service you will get your good within 48 hours (unless there is an incident with the transport or shortage of stock). Express delivery is available for the following cities and their immediate surroundings: London, Manchester, Birmingham, Belfast, Edinburgh and Glasgow. We work with Chronopost and DPD to ensure the best service in the shortest time possible. Find out more about delivery times. Onedirect will send you an email when the package is in the hands of the transport company. You can also check the status of your order on your personal account page - a link will take you to the transport company's website, where you can track your order. Please check the package while the delivery person is still present to ensure that the products have not been damaged during the delivery. In the event that a product is damaged, repack the package and call us so that we can take the appropriate steps. Onedirect recommends you keep all original packaging as they are necessary in case of returning a product. Onedirect gives you 14 days to return a product if it is unwanted and 30 days if the product is faulty or damanged. To return a product you must contact our sales team on 0333 123 3050. We will send you a returns reference number by email, then you can return the product to us. All products must be returned in a perfect state with their original packaging in order to receive a refund or an exchange. For security, purposes we request that you send your order by registered mail, marking the return reference number clearly on the outside of the package. Find out more. GET YOUR RETURN PERIOD EXTENDED TO 30 DAYS Simply call us and we will organize the return of any article that does not suit you or is not functional (according to terms and conditions of sale). We will replace or refund upon receipt of the product (any shipping costs incurred will be at our cost). GET INSURED AGAINST ANY DAMAGE Get an extra 7 days after delivery to report any damaged product during shipping. Simply call us and we will organize the return of your article(s). We will replace it or refund it as soon as it is received. Simply call us and we will organize the return of any article that does not suit you or is not functional (according to terms and conditions of sale). Find out more about the Onedirect after-sales service. Go to your account page online and you can access your order history, where you can reprint all your invoices. For security reasons, the invoices are only kept in your client area for a maximum of 6 months. After this time, if you need copies of any invoices, please contact our sales team on 0333 123 3050. Just click on the link that appears at the bottom of the last newsletter you received. You will immediately be removed from our list and will no longer receive any newsletters. Click on 'My account' and then click on the link 'Forgotten your password?'. Enter the email that you used to make your first order and we will send your password to your inbox. The Onedirect team is available from Monday to Friday from 8.30am to 5.30pm (except on bank holidays). You can call us during office hours on 0333 123 3050 or contact us in writing Click Here.